Book hotel rooms online with us at Hotel Dom Pedro Golf Resort at the lowest rate, guaranteed. 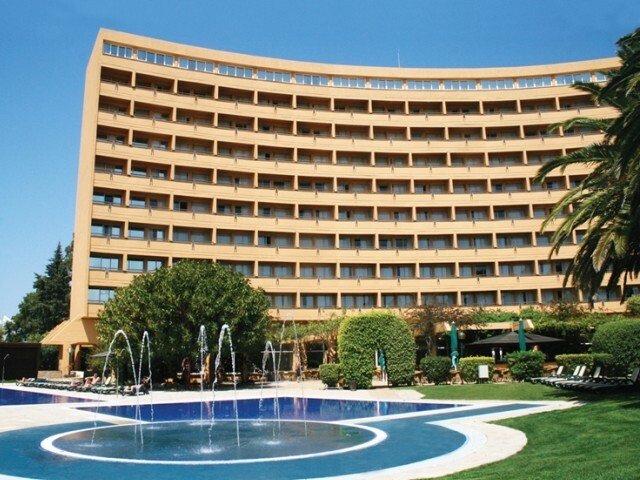 Get a holiday discount room rate at the 4 Star Hotel Dom Pedro Golf & Spa in Vilamoura Resort in the Algarve. The hotel has 263 holiday bedrooms providing accommodation from 2 to 3 adults and is within a few minutes walk of the sandy beach, the Casino and the Marina with its many shops and restaurants. All bedrooms have satellite TV, mini-bar, air-conditioning and a terrace. The Hotel Dom Pedro Golf is very popular with golfers as it is within minutes drive to the many 18-hole golf courses in the immediate area. The Hotel Dom Pedro Golf & Spa in Vilamoura facilities include two restaurant, summer barbecue and snack-bar, the Spa Aquae which features an indoor swimming pool, massages and treatments, a hot tub, a Fitness Centre, 3 tennis courts with nightlights, landscaped gardens and a Kids playground. During the season there is live evening animation. Wi-Fi is available.